True healing is an inside job that addresses the body as a wholism: mind, body and spirit. We are a community of these components working together to make us who we are and who we are meant to be. We are designed to embrace the natural world to keep us running in balance and … [Read more...] about Healing What’s Eating You…. Join us for this enlightening educational experience as together we create a healthier, happier, more fulfilling world. Our Next 100% OnLine Class begins Summer 2019. Program Date To Be Announced. Just $300 holds your place in class! Sign Up For Our Newsletter To Keep Up With Sales and Promotions. Our next class will be in mid 2019. There is an evolutionary shift taking place in the world of healing. Nutritional Science has made many discoveries in the past five years. They now know that genetics or bad luck plays a very small role in why 1 out of 3 women will contract cancer in their lifetime. Researchers have concluded that 70-90% of all cancers are caused by diet, lifestyle and environmental factors. If you are new to fighting cancer with natural methods, you are going to want this book. 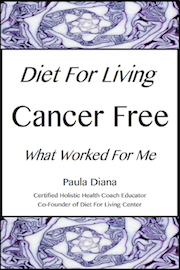 I share results oriented Natural Healing strategies I used to fight my own cancer, and Win. Alkaline Water: Beneficial Or Bogus? Bee Killing Pesticide On Nursery Plants- How To Avoid It…. Is The Collagen Trend The New Fountain Of Youth? We Say No To GMO! Our classes are where it all begins. Working together with like minded people creates great strength, power and possibility. Beautiful friendships develop. We learn we’re not alone.